Just dream of a Madhav Events wedding and Leave on us to convert your dream into reality as your dream is our pleasure .Madhav Marriage weddings. Essential Luxuries is where you find everything you need to make an already Fabulous event even more spectacular!! 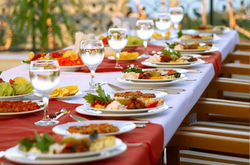 We cater to peoples" group rnging from 50 to 15000.Apart from mouth watering food and beverages we undertake the entire event planning of wedding too. Male waiter service suppliersFor wedding, birthday party, lunch, meeting, etc.